This is why Welty-Boldt are Change Bandits for the Have a Heart, Do Your Part radiothon. The construction office is adorned with radiothon posters and Change Bandit buckets, but that’s not the only way the team is getting involved. And the involvement doesn’t stop there. The Welty-Boldt carpenters creatined a plan and began constructing an 8-foot by 8-foot heart. “The heart is made out of recycled form plywood, so we didn’t have to buy material to make it,” said Tom Conti, Building on the Promise project superintendent. 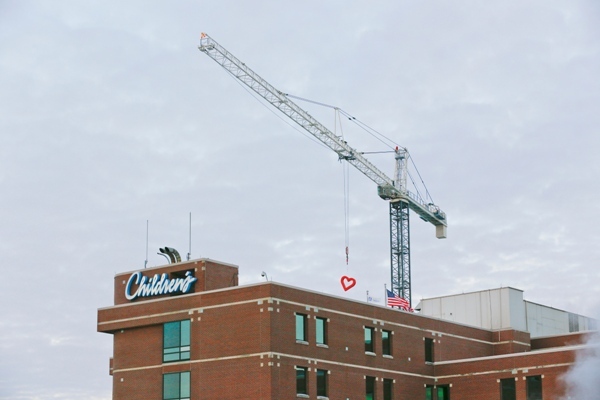 All Tower Cranes — the company supplying and managing the 2 cranes on site — gave their blessing to suspend the heart one of their cranes. Zezelewicz has challenged Conti to stay involved with the hospital’s efforts until the building construction is completed in 2015.